The Norman Hall rehabilitation and expansion is moving along nicely, with the Education Library currently open for use. The renovations are continuing to improve infrastructure, as well as enhance the Norman Hall experience for students, faculty and staff. This fall, the UF Education Library welcomed an influx of old and new students. Filled with various renovations such as new furniture, a computer lab, additional study rooms, a lactation room, dual monitor computers and more electrical outlets, the library is now more modern than ever. The library hadn’t seen upgrades since its original opening in 1980. Now, it’s a premier study space for students, both within the college and university-wide, to study and access resources. This is evident in the 67% increase in use since the reopening as reported by UF Libraries Dean, Judith Russell, at the re-opening ribbon cutting held on Nov. 9. Former Florida Congressman and University of Florida alumnus, John Mica (BAE ‘67) recently visited on Monday, Nov. 5 to observe construction progress including the newly renovated Education Library and developments made within the Norman Hall rehavilitation. Mica has been a long-time supporter and advocate of this project, and a vital asset in the funding of the rehabilitation of historic Norman Hall. “I thank all of them [legislators and friends] for their incredible efforts in making this possible,” Mica said, at the Norman Hall Rehabilitation Groundbreaking Ceremony. 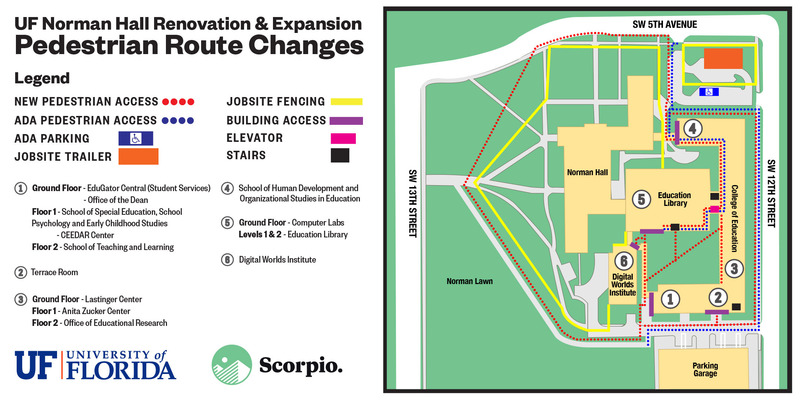 With the project, access to the college has changed, so it’s important to look at the most recent map provided to find pedestrian route changes, building access and parking prior to navigating the college. Signage is posted around the site for easy reference. Construction fencing now surrounds Old Norman on all sides. The small parking lot on the northeast side of the college is also limited for construction use. A new walkway/bikeway from the parking garage to the SW 13th Street underpass has been constructed, located between the Norman Field and Old Norman. Other walkways, bike paths and access points have been rerouted as well. Also, all bike racks have been moved to new cement pads outside the fenced area which can be found on the SW and NE sides of the building. Be sure to plan extra time when navigating Noman, a lot has changed. For the safety of all, please stay out of the off-limits construction zones due to hazardous material work. Please continue to use caution as you navigate around construction. We appreciate everyone’s cooperation and look forward to more updates in the future.